IN 24th Dec. With ACTIVE on the RIMU trip, Peel Forest Park, Braemar Station near Mt Cook. 25th Dec. Hiking in Mt. Cook National Park. 26th Dec. Queenstown stop-over then on to Lake Manapouri. 27th Dec. Bike ride to Te Anua, Hiking near Homer Tunnel, staying at Hollyford camp in Milford. 28th Dec. Kayaking in Milford Sound, back to Queenstown. 29th Dec. 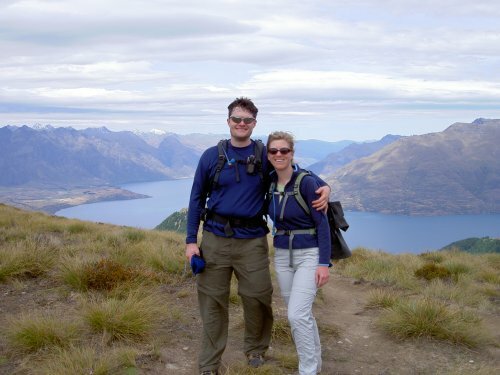 Climb Ben Lomond Peak with afternoon in Queenstown. 30th Dec. Lake Wanaka Hike and on to Mt. Aspiring National Park, staying in Makarora. 31st Dec. Hike at Franz Josef Glacier, staying in Okarito. 1st Jan. Kayaking Okarito Lagoon. 2nd Jan. West Coast drive, glow worm hike in Punakaika Rainforest and Pancake Rocks hike. 3rd Jan. Drive to Saint Arnaud and Backpacking into Headlake Hut. 4th Jan. Continue backpacking to Mount Angelus Hut with climb of Mount Angelus. 5th Jan. Backpacking back out to trailhead with Forrest winery tour in the afternoon; staying in Kaikoura. OUT 6th Jan. Last day with ACTIVE. Snorkeling with the seals in Kaikoura and picnic lunch. 7th Jan. Akaroa day trip.